Find the right land for you! 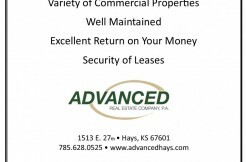 Advanced Farm & Ranch can provide complete services for Private Treaty, Auction, and 1031 Exchanges. Services are available throughout Kansas; we will travel to your location. Your property will receive extensive marketing, locally, and nationally. Broker and realtors affiliated with Advanced Farm & Ranch have lifelong experience and ownership with farming and ranching. For a comfortable experience from a qualified marketing firm that will get you the best possible price. Give us a call!